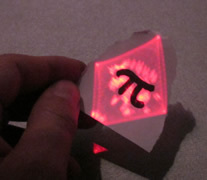 The `Smart Laser Projector' (SLP) is a modified laser-based projector capable of displaying graphics on a variety of non-prepared surfaces, while simultaneously using the beam (at the same or different wavelength or polarization) as a LIDAR probe gathering information about that surface position, orientation and shape, fine texture, spectral reflectance and even relative motion. It is therefore possible to synthesize an artificial surface reflectance, or to correct geometrical warp, all in real time and without the need of calibrating a camera and a projector. We have developed two prototypes, one working in raster-scan mode, and another in vector graphics mode. Our previous research on the Smart Laser Scanner, scoreLight and Sticky Light can be seen as special applications of the SLP in vector-graphics mode. Applications of the SLP may include dermatology (enhancement of superficial veins or direct visualization of anomalous polarization induced by cancerous cells), non-destructive control (visualization of microscopic scratches, oily spots or mechanical stress), authentication (visualization of non-fluorescent UV or IR watermarks thanks to 'artificial fluorescence'), and in general all sort of augmented reality applications using any available surface for projection (tables, desktops, walls and floors, but also human skin, printed material and paintings, market products on a shelf, etc). Augmentation means here overlaying of alphanumeric data or icons over real object (for instance, human-readable price tags appearing under machine-readable barcodes), dynamic cueing (marking secure perimeters, indicate directions or highlighting dangerous obstacles) and line and contour enhancement for practical or aesthetic purposes. projection at very long distance in vector graphics mode ideal for outdoor interactive applications. 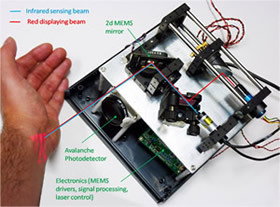 A MEMS based, compact SLP may eventually be embedded on clothes and used as a wearable display capable of transforming on-the-flight any surface near-by into a full interactive 'sensing display'. A. Cassinelli, A. Zerroug, J. Angesleva and M. Ishikawa, "Camera-less Smart Laser Projector", Laval Virtual - 12th Virtual Reality International Conference / ReVolution Demos, April 7-11 2010, Laval, France. (Additional (handout): [PDF-2,2MB], Poster [PDF-5.3MB]). [SIGGRAPH E-tech Revolution Award: invited to SIGGRAPH E-Tech 2010].